Load into memory the descriptor file for a trained cascade classifier. Required by the object detection method (see detect()). While you may use your own cascade description files, this library links as well to a standard family of detection cascades (CASCADE_FRONTALFACE_DEFAULT, CASCADE_FULLBODY, …). These are installed automatically in the Windows installer and most Linux packages. 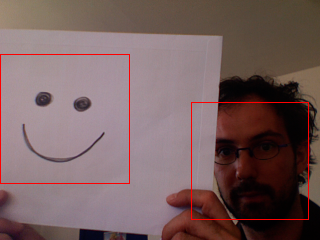 For those using Macs, we have included these files in our opencv-framework-*. *.dmg installer. If you use a different Mac installer, you will have to import these files on your own. It is recommended that you avoid loading the file at each cycle.